For a sample of Kenji Mizoguchi's unique genius, I point you to one brief but memorable scene in the middle of “Ugetsu” (1953). Tobei (Sakae Ozawa), one of the film's main characters, is a poor villager who dreams of becoming a samurai. In order to do so, he must first secure his own set of armor and weapons. He decides his only hope is to steal this expensive treasure from someone else, and goes out in search of a likely candidate. We have all watched similar scenes in movies before: our hero needs a quick change of clothing so he knocks out some poor faceless nobody (listed as HENCHMAN #1 in the screenplay) to get what he needs. No fuss, no muss. We don’t give the nameless goon another thought. Mizoguchi adopts a different approach. As Tobei skulks along in the shadows, the film cuts to a conversation between two new characters, a general and one of his samurai. The general has been mortally wounded, and he orders his soldier to behead him to end the suffering. The samurai does as he is told, then turns from his revered master and stumbles away. With tears welling up in his eyes, he is about to sit down to gather his emotions. Just then, Tobei leaps out and stabs the vulnerable warrior to death, claiming the general’s head as his own kill and parlaying it into a short-lived stint as a full-fledged samurai in his own right. What a startling and powerful scene. How are we supposed to feel about Tobei now? Can we ever forget the samurai and his general, characters glimpsed for a few fleeting moments? This it the special brilliance of Mizoguchi, at least in his best films (which is most of them): the ability to breathe life into every character and to weave a complex web of relationships among them. We see this sensibility at play again in the central sequence of “Ugetsu.” Genjuro (Masayuki Mori), our main protagonist, is a potter who brings his wares to the big city in hopes of scoring a major sale. There he meets Lady Wakasa (Machiko Kyo, who also played the woman in “Rashomon”) who asks him to bring his finest crafts to her manor. There he falls madly in love with her; as if in a fever dream, he forgets about his wife and child and agrees to marry the Lady. Pretty soon we realize that Wakasa is not your typical lady, but rather a ghost (the pale-white make-up is a hint, the disembodied voice of her dead father is a better one). Genjuro languishes helplessly in her clutches until he meets a traveling priest who gives him the power to break free of her spell. But rather than a scene full of spooky howls and flickering candles, Mizoguchi fashions an emotionally resonant confrontation. A tearful Wakasa begs Genjuro to stay with her. Her nurse (also a ghost) explains that Wakasa died young without knowing the love of a man - isn’t she entitled to some happiness even in death? The scene is wrenching. We understand why Genjuro wants to escape; he has a family of his own, after all, and he must remain among the living. But he also promised his love to Wakasa, who returned it tenfold, though perhaps too much for a mere mortal to handle. Everyone is both right and wrong in his or her own way and each of the characters is fully alive (even the dead ones) in this dynamic and complex scene. “Ugetsu” is more frequently listed as “Ugetsu monogatari” which translates roughly as ‘Tales of Moonlight and Rain”, the title of an 18th-century collection of ghost stories by Akinari Ueda. Ueda’s collection, along with a short story by Guy de Maupassant (“How He Got the Legion of Honor”), provides the inspiration for the film, though Mizoguchi and screenwriters Matsutaro Kawaguchi and Yoshikata Yoda (one of Mizoguchi’s most frequent collaborators) relocate the story to 19th-century Japan. The story concerns two couples: Genjuro and his wife Miyagi (Mizoguchi regular Kinuyo Tanaka) and Tobei and his wife Ohama (Mitsuko Mito). Each of the husbands is blinded by ambition (Genjuro for gold, Tobei to become a samurai) and each subjects his wife to terrible hardship as a result of it. As is typical in a Mizoguchi film, the women must make terrible sacrifices due to the selfishness of the men in their lives. Each woman meets a separate bad fate, and both husbands get the opportunity to atone for their sins though each in a very different manner. Ghosts travel freely among the living. Japan, as depicted in “Ugetsu,” is a country ravaged by civil war, and the violence has so brutally scarred the landscape that the border between this world and the afterlife has blurred beyond recognition. One of the many great pleasures in “Ugetsu” is the naturalistic approach Mizoguchi takes to his various ghosts and spirits. Lady Wakasa walks through the marketplace like any other customer. Ghosts do not jump out of walls screaming “Boo!” but are integrated into the domestic space. One character returns as a ghost only to cook a pot of stew and tidy up. A ghost ship encountered on the lake is both real and not real at the same time, and it is certainly a tangible object. 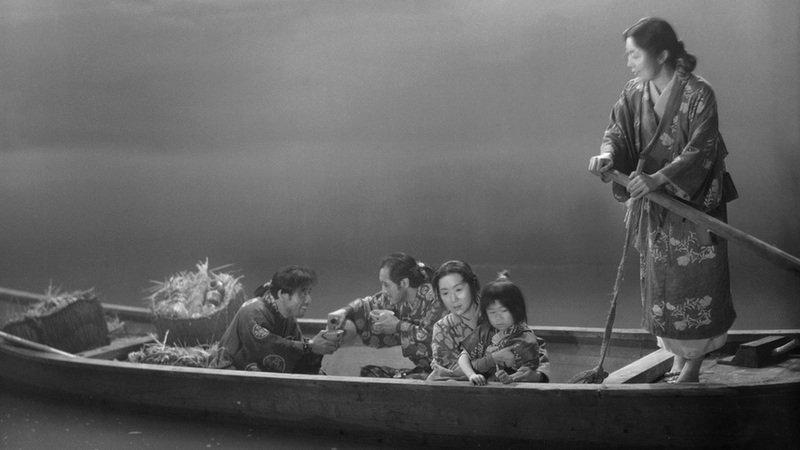 Like Ozu, Mizoguchi films most of his scenes in long master shots with minimal editing within any single scene. Unlike Ozu, Mizoguchi moves his camera constantly (most of the scenes were shot with the camera on a crane), gliding both horizontally and vertically to create a gentle, lyrical effect. I am tempted to push my interpretation a little too far and claim that the hovering camera haunts the film, but I will resist the urge. “Ugetsu” is a beautiful film even if the people in it are sometimes ugly. Full credit is due to renowned cinematographer Kazuo Miyagawa whose black-and-white photography is simply breathtaking. 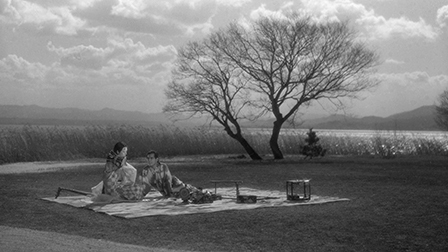 “Ugetsu” often places very highly in critical polls, and is usually considered Mizoguchi’s masterpiece. I actually prefer two other Mizoguchi films (also critical favorites): “The Story of the Late (or Last) Chrysanthemums” (1939), and especially “Sansho the Bailiff” (1954), one of the most devastating films I have ever watched. Regardless, “Ugetsu” is one of the defining films not only of Japanese cinema but all of cinema, and your film knowledge is incomplete until you have seen this gem. More than once. The film is presented in its original 1.37:1 aspect ratio. 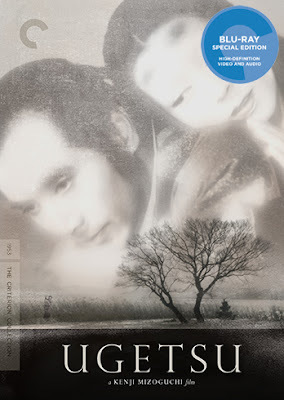 The 2005 Criterion SD release of “Ugetsu” (in 1.33:1) was strong but displayed a considerable amount of damage from the source material, particularly some prominent scratches. This newly-sourced restoration eliminated many, though not all, of the scratches and other signs of damage, though a bit of flicker and the occasional soft shot still crop up. That's a minor complaint for an impressive 1080p transfer which represents a substantial improvement over the old SD in just about every way, even strengthening the already solid black-and-white contrast, and which justifies a double-dip purchase all by itself. The LPCM mono mix is crisp with just the occasional moment of slight dropoff. It sounds fairly hollow throughout, but this is due to the source and actually works quite well for such a haunted film. Optional English subtitles support the Japanese audio. The 2005 Criterion SD consisted of two DVDs in separate cases both tucked into the cardboard case. This 2017 Blu-ray upgrade imports all of the extras from the prior release but includes them all on a single disc with a fold-out case, inside of which the insert booklet is tucked. The keep case is then placed inside of a cardboard slip case with the same cover art as the 2005 case. The thick square-bound insert booklet is a copy of the 2005 booklet featuring an essay by critic Phillip Lopate and three of the short stories which inspired the film: “The House in the Thicket” and “A Serpent's Lust” by Akinari Ueda and “How He Got The Legion of Honor” by Guy de Maupassant. I've had twelve extra years to reflect on both “Ugetsu” and Mizoguchi since I originally wrote this review, and my appreciation of the film and the filmmaker have only increased with time. I'm pretty sure most film buffs have the same experience with this great master of cinema. It's too facile to proclaim an equal to Ozu and Kurosawa; he is also an equal to Resnais and Welles and Akerman and Apichatpong and Rossellini and Varda and... well, you get the picture. You should also get this impressive Blu-ray release from Criterion.